(Nanowerk News) Rice University’s latest nanotechnology breakthrough was more than 10 years in the making, but it still came with a shock. Scientists from Rice, the Dutch firm Teijin Aramid, the U.S. Air Force and Israel’s Technion Institute this week unveiled a new carbon nanotube (CNT) fiber that looks and acts like textile thread and conducts electricity and heat like a metal wire. In this week’s issue of Science ("Strong, Light, Multifunctional Fibers of Carbon Nanotubes with Ultrahigh Conductivity"), the researchers describe an industrially scalable process for making the threadlike fibers, which outperform commercially available high-performance materials in a number of ways. The research team includes academic, government and industrial scientists from Rice; Teijin Aramid’s headquarters in Arnhem, the Netherlands; the Technion-Israel Institute of Technology in Haifa, Israel; and the Air Force Research Laboratory (AFRL) in Dayton, Ohio. The phenomenal properties of carbon nanotubes have enthralled scientists from the moment of their discovery in 1991. The hollow tubes of pure carbon, which are nearly as wide as a strand of DNA, are about 100 times stronger than steel at one-sixth the weight. Nanotubes’ conductive properties — for both electricity and heat — rival the best metal conductors. They also can serve as light-activated semiconductors, drug-delivery devices and even sponges to soak up oil. Unfortunately, carbon nanotubes are also the prima donna of nanomaterials; they are difficult to work with, despite their exquisite potential. For starters, finding the means to produce bulk quantities of nanotubes took almost a decade. Scientists also learned early on that there were several dozen types of nanotubes — each with unique material and electrical properties; and engineers have yet to find a way to produce just one type. Instead, all production methods yield a hodgepodge of types, often in hairball-like clumps. Creating large-scale objects from these clumps of nanotubes has been a challenge. A threadlike fiber that is less than one-quarter the thickness of a human hair will contain tens of millions of nanotubes packed side by side. Ideally, these nanotubes will be perfectly aligned — like pencils in a box — and tightly packed. 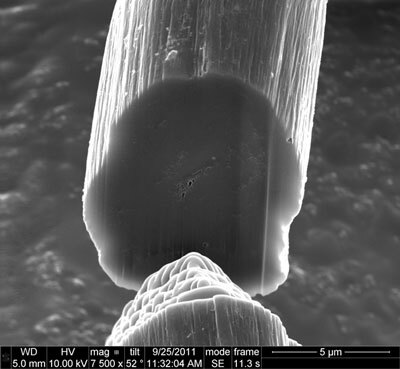 Some labs have explored means of growing such fibers whole, but the production rates for these “solid-state” fibers have proven quite slow compared with fiber-production methods that rely on a chemical process called “wet spinning.” In this process, clumps of raw nanotubes are dissolved in a liquid and squirted through tiny holes to form long strands. Nanotubes are tightly packed in the new carbon nanotube fibers produced by Rice University and Teijin Aramid. This cross section of a test fiber, which was taken with a scanning electron microscope, shows only a few open gaps inside the fiber. Shortly after arriving at Rice in 2000, Pasquali began studying CNT wet-spinning methods with the late Richard Smalley, a nanotechnology pioneer and the namesake of Rice’s Smalley Institute for Nanoscale Science and Technology. In 2003, two years before his untimely death, Smalley worked with Pasquali and colleagues to create the first pure nanotube fibers. The work established an industrially relevant wet-spinning process for nanotubes that was analogous to the methods used to create high-performance aramid fibers — like Teijin’s Twaron — which are used in bulletproof vests and other products. But the process needed to be refined. The fibers weren’t very strong or conductive, due partly to gaps and misalignment of the millions of nanotubes inside them. “Achieving very high packing and alignment of the carbon nanotubes in the fibers is critical,” said study co-author Yeshayahu Talmon, director of Technion’s Russell Berrie Nanotechnology Institute, who began collaborating with Pasquali about five years ago. The next big breakthrough came in 2009, when Talmon, Pasquali and colleagues discovered the first true solvent for nanotubes — chlorosulfonic acid. For the first time, scientists had a way to create highly concentrated solutions of nanotubes, a development that led to improved alignment and packing. Pasquali said other labs had found that the strength and conductivity of spun fibers could also be improved if the starting material — the clumps of raw nanotubes — contained long nanotubes with few atomic defects. In 2010, Pasquali and Talmon began experimenting with nanotubes from different suppliers and working with AFRL scientists to measure the precise electrical and thermal properties of the improved fibers. During the same period, Otto was evaluating methods that different research centers had proposed for making CNT fibers. He envisaged combining Pasquali’s discoveries, Teijin Aramid’s know-how and the use of long CNTs to further the development of high performance CNT fibers. In 2010, Teijin Aramid set up and funded a project with Rice, and the company’s fiber-spinning experts have collaborated with Rice scientists throughout the project. “The Teijin scientific and technical help led to immediate improvements in strength and conductivity,” Pasquali said. The fibers reported in Science have about 10 times the tensile strength and electrical and thermal conductivity of the best previously reported wet-spun CNT fibers, Pasquali said. The specific electrical conductivity of the new fibers is on par with copper, gold and aluminum wires, but the new material has advantages over metal wires. For example, one application where high strength and electrical conductivity could prove useful would be in data and low-power applications, Pasquali said.